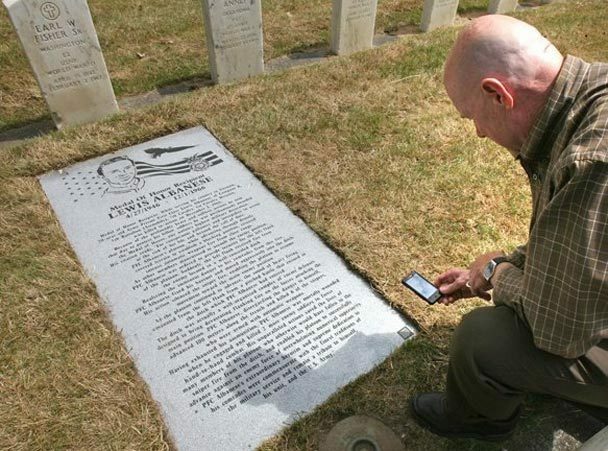 QR codes on headstones in graveyards: Is it brilliant or creepy? I had to read this a couple of times to make sure it was true when I found it in the Seattle Times but yes it is true that in a world gone mad with QR codes they are now coming to the one place that we all presumed was sacred…head stones in graveyards. A company in Seattle is offering to add a QR code to the head stone of the deceased person. When family or loved ones scan the QR code, it reveals additional information about the person including photos, videos and text about the life they lived. I’m all for technology being used in innovative ways but is this maybe a step too far? Aren’t we supposed to respect the dead and leave them in peace? The last thing you want when you are laying flowers and trying to remember that special moment with a loved one is to have a bunch of people on their phones beside you watching videos and scanning codes. Hold on- Maybe this is a good idea? When you get over the initial shock of thinking this is some sort of cheap marketing stunt it could actually be a good idea if done correctly. Imagine all those trips to a cemetery where you gaze at names and dates that mean absolutely nothing to you. Imagine if instead you could quickly scan a code and be immersed into the life of the person below with highlights and interactive media. It would have to be a very fine balance and done correctly because the last thing you want to see is people having their Twitter accounts on a gravestone or some sort of other tacky links which is bound to happen. Added to people that died in wars or long ago could be a valuable way for teaching new generations about wars or other ways in which people used to die that have long been forgotten. What do you think? A step too far or technology being used in a smart way?